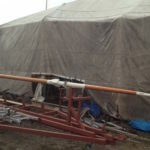 The storms in early June did no more damage to the tent, but the frame is seriously buckled and, once it's opened up, the lean from the vertical is clear to see. 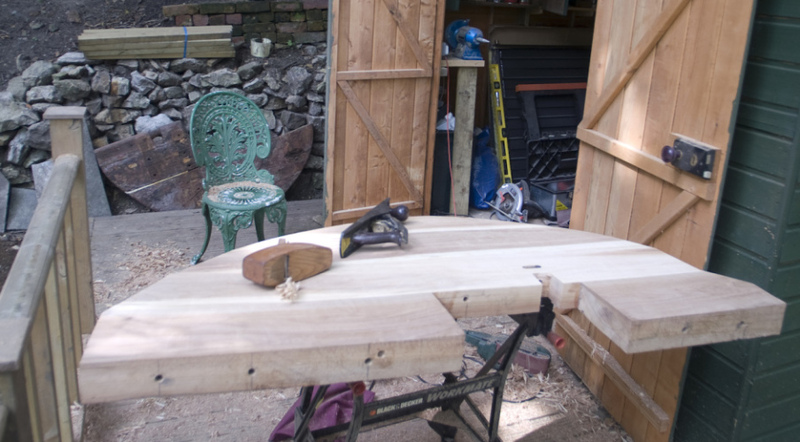 Back in March 2008, Steve made a new rudder, having sourced some elm from a Derbyshire woodyard. 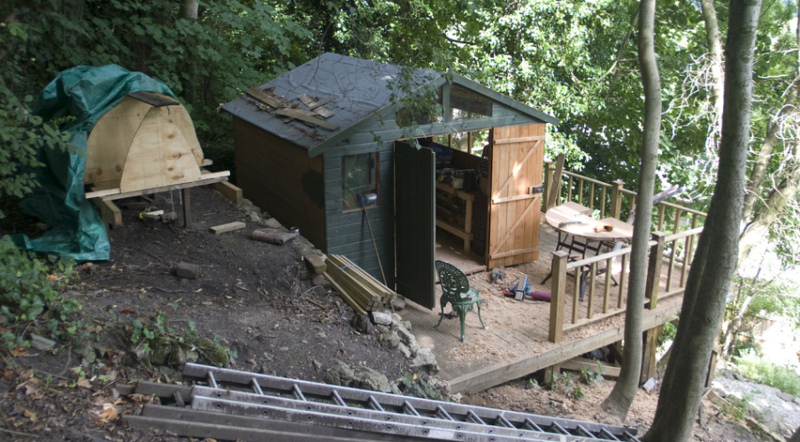 Constructed in the newly-built garden workshop at home in Matlock Bath, it seems such a long time ago now. Those were the days when we thought the project would not be quite such a 'long haul'! 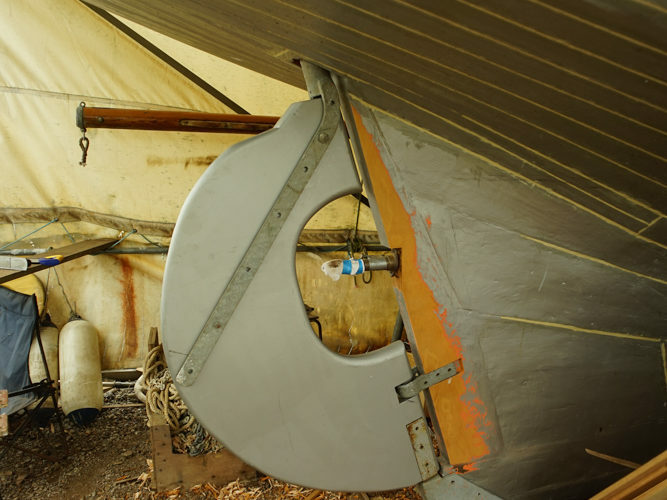 But at last, after storage under the boat in Suffolk for the past eight years, it's time to set the rudder in place. 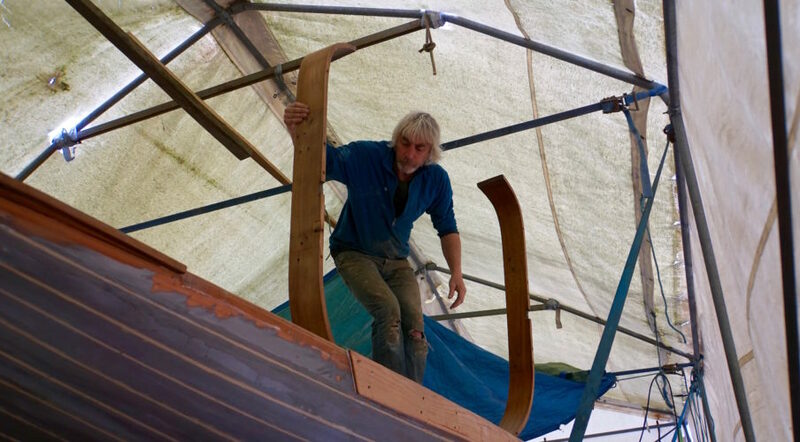 Returning after a couple of days in the Derbyshire warmth, Steve set to work on the rudder in early June, 2016. 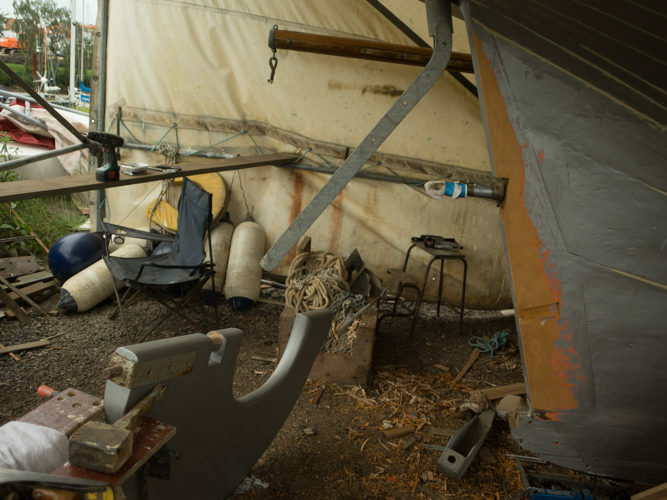 There was some tidying up of the rudder stock to do and fitting the 'boot', then hanging the rudder to make sure it could swing freely. 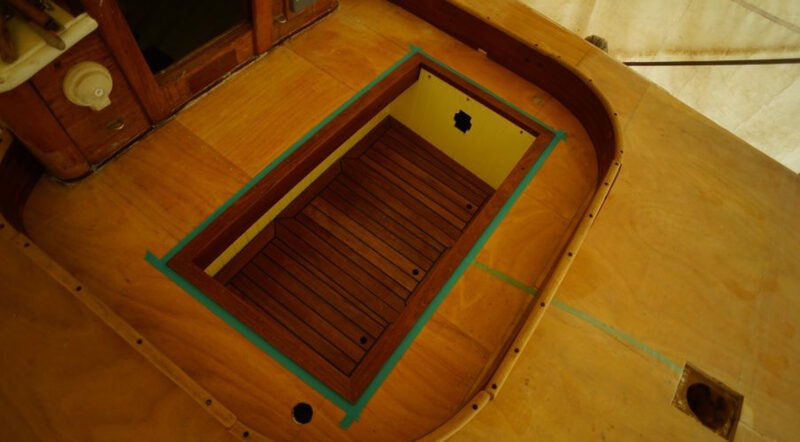 Teak edges for hatch and all through-deck fittings. New Samson post in place. 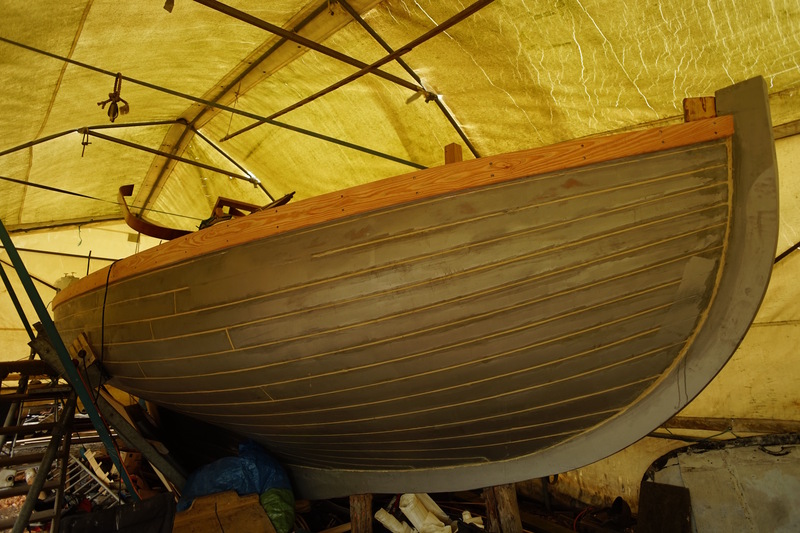 Final sanding of the coaming, up it goes! 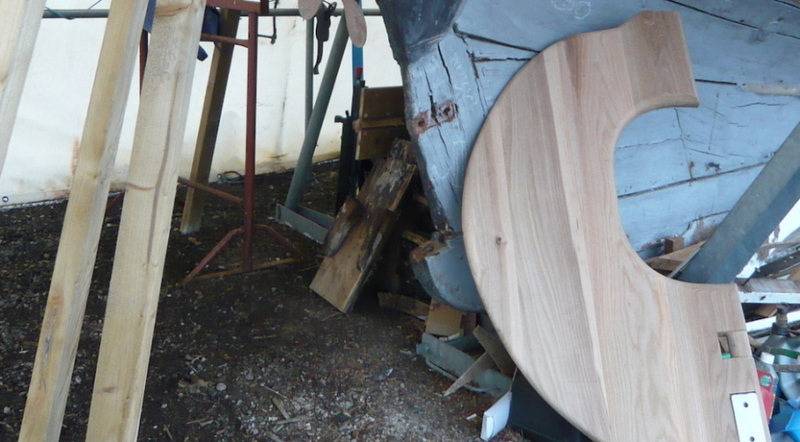 Once the rubbing strake's done, there's all those little bits to do. 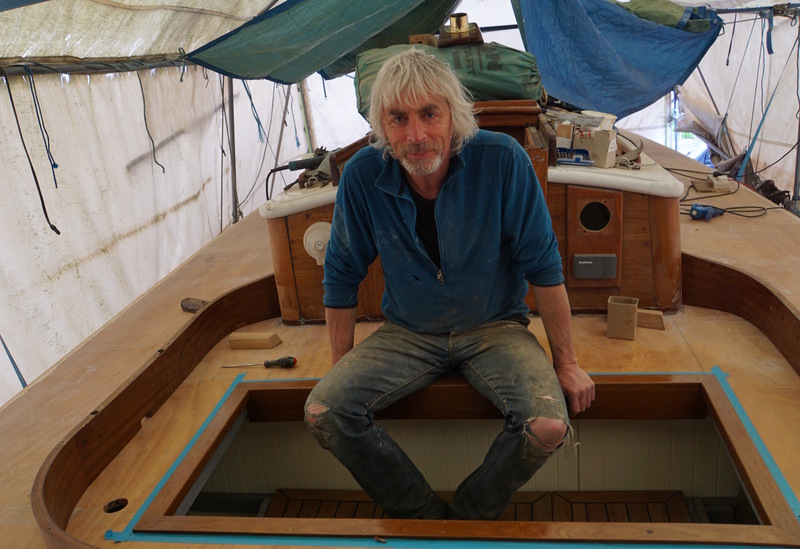 Steve carefully mitres teak edges for all the through-deck fittings. 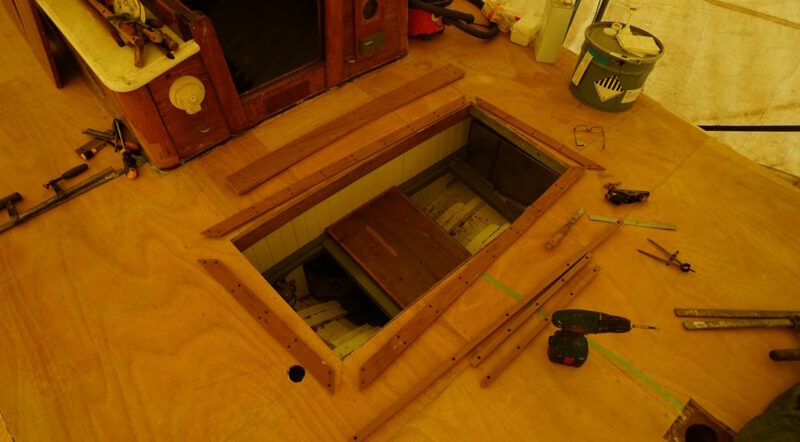 There's the cockpit to finish off, again with teak edging, before sanding down the coaming, hoisting it up onto the deck again, and setting it in place to bolt in and seal. Meanwhile, Bev's been doing OK with cycling and walking recommended, relieving the frustration at doing nothing. To keep the 'other project' on track, she set up a meeting with the architect on 25th May. Steve returns to Derbyshire for a couple of days then we both drive to Suffolk for the Bank Holiday weekend. Wide sunny skies until Monday, when 40 mph winds are forecast. With the van roof down, Steve secures the tent as best he can and we retire for a stormy night. Tuesday dawns bitterly cold, still windy, the tent flooded but no more damage and after a trip to Thorogoods we decide to retreat to the warmth of Derbyshire again. With the beginning of May looking promising, Steve goes down to Woodbridge. Departing much later than planned on the 11th, he didn't arrive 'til nearly midnight! Bev stays at home, still hobbling around, looking forward to some advice from the physio about what she can and can't do . . . Steve's first job is to make more repairs to the tent. It has a serious 'lean', several degrees from the perpendicular, with the poles bent at alarming angles. Apart from the ripped section in the side, there's several holes along the top where the poles have rubbed through the canvas . . . an inner tent made of tarps is a necessity whenever rain is forecast now. 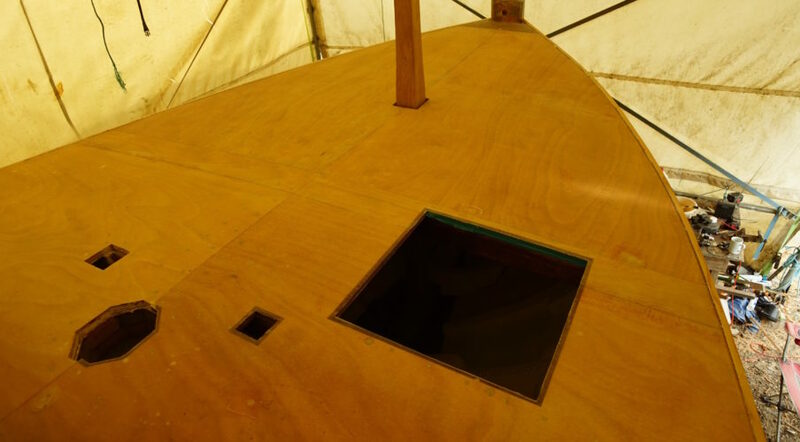 The tent fixed as well as he can manage, Steve concentrates on the boat, removing all the 'peel ply', filling the blemishes and finally sands the newly-glassed deck. Almost ready for buying the paint and a trip to Larkmans confirms the colour. 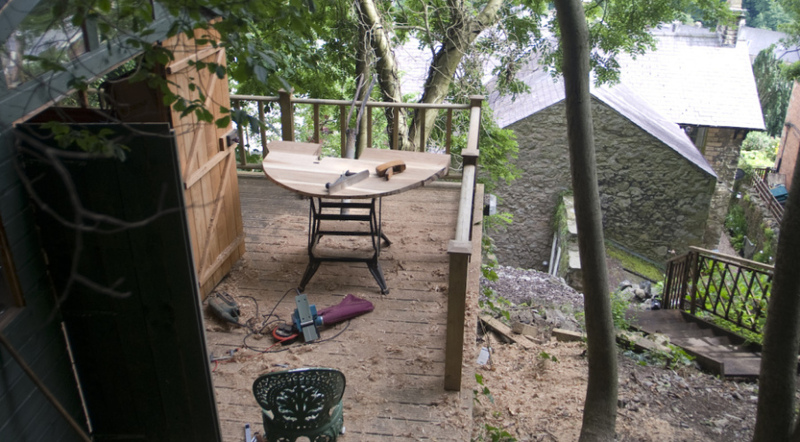 James is finishing the deck of 'Charm': International Sand it is. 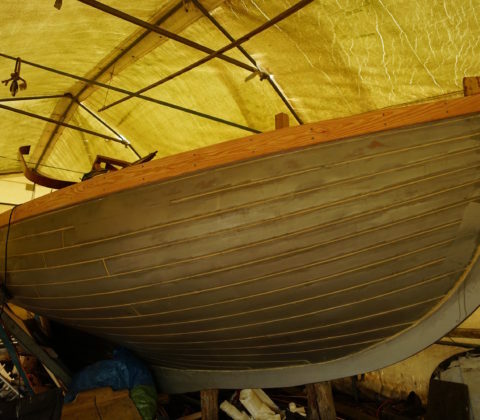 Next job is the rubbing strake, carefully crafted from larch and fixed along both sides from stem to just past the cockpit coaming. A visitor passes complimentary comments on the fair of the hull. Storm damage to the tent, but it's lasted well! 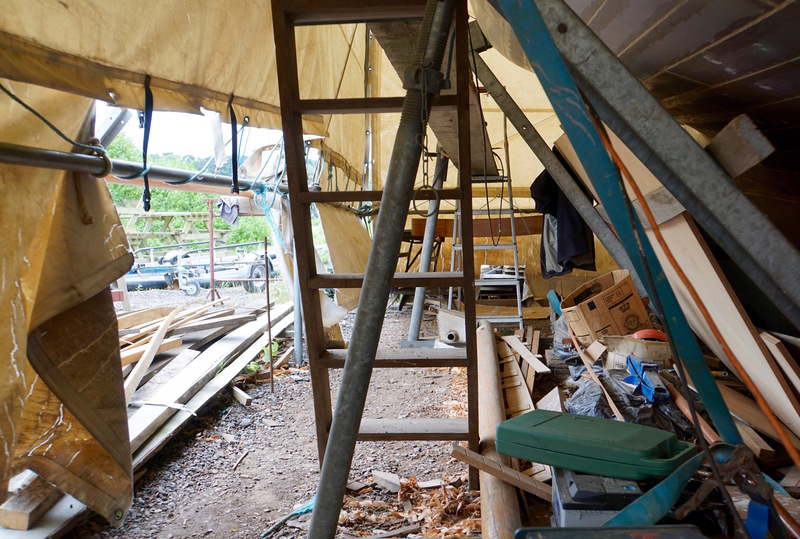 Mast restored to its stand and tent patched up . . .
A call from Toby and Hugo, wanting help in retrieving their tender from Fambridge, means the chance for a ‘one way’ trip with an empty trailer to Essex. 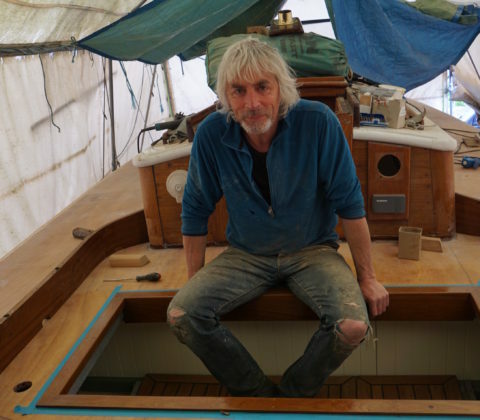 Steve manhandles the repaired and varnished cockpit coaming down to the road. 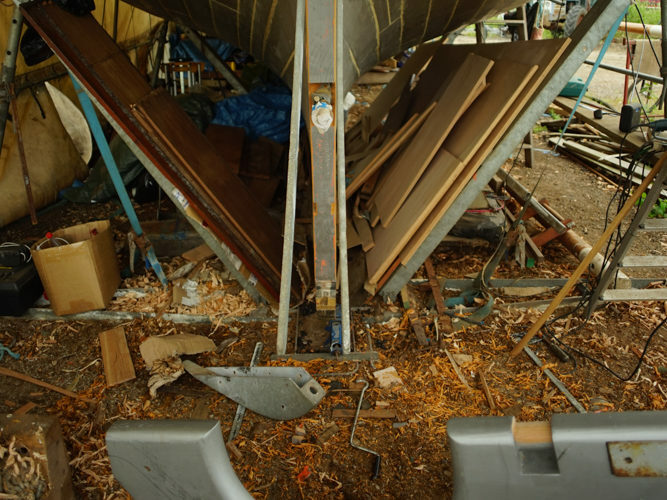 He lashes it to the trailer, carefully packing it in cardboard for the journey with Hugo. 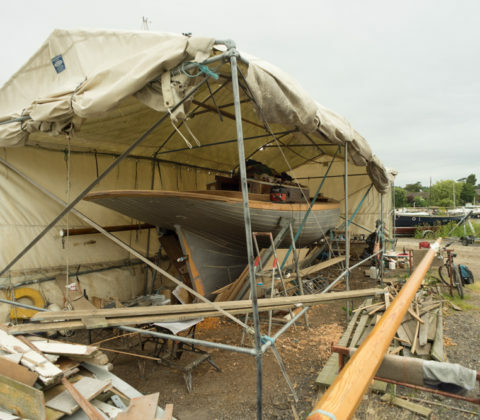 They make good time to Woodbridge, but find that Storm Katie took her toll on the tent. A full section of one side is ripped out. 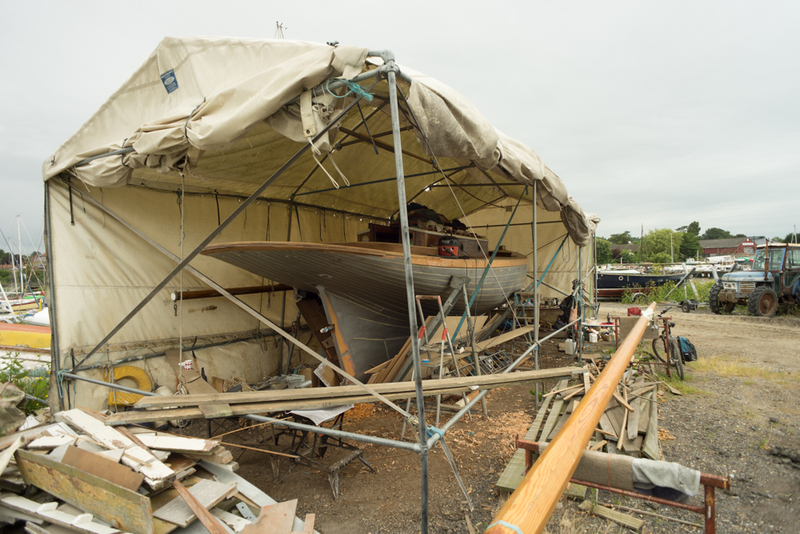 The mast has also been blown from it’s stand, damaging new varnish applied last summer. But as Hugo says, it’s nothing that would not happen during a good blow at sea! The tent, however, really won’t stand up to any more gales, so 2016 has to be the launch year, as promised last August in Ipswich! 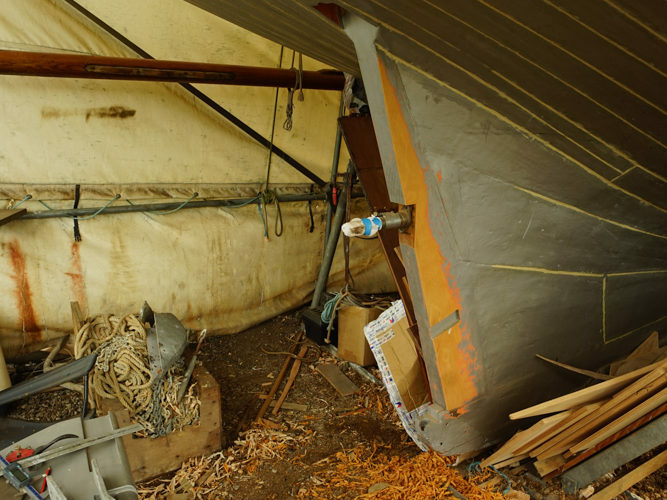 The wintry weather, since an early spring-like Easter, makes another trip to Suffolk quite unattractive for now, though, so we stay at home doing more of the ‘little jobs’ for the boat and think about plans with the architect for the ‘other project’.